Although the Chinese hospitality market continues to grow at breakneck speed, operators are facing challenges in the form of fierce competition and fickle customers eagerly searching for the next big trend. As F&B plays an increasingly important role in a hotel’s value proposition, using technology to reduce food costs by preventing waste is too good an opportunity to ignore. The Chinese hospitality market is booming, with double-digit growth reported in 2017. This has largely been fuelled by demand at home, with an 11% year-on year-increase in domestic visitor arrivals reported by global real estate consultants Knight Frank. China’s hotel industry is now worth an estimated $44bn, with more than 2.5m hotel rooms, and some of the strongest growth has been within the luxury segment - Beijing, Shanghai and Macau now boast more than 93,000 five-star hotel rooms. Industry commentators believe that there is still significant headroom for growth. There are still only four hotel rooms per thousand head of population, which compares to ten per thousand in the UK and twenty per thousand in the USA. A.T. Kearney forecast that in the next ten years the Chinese hotel market will grow to $100bn, with more than 6.5m hotel rooms. As competition intensifies, operators will need to differentiate their properties in order to remain competitive, writes Michael Taylor in Asia Hotel and Catering Times. While some operators have taken to rebranding or securing prime locations, F&B is increasingly an opportunity for operators to carve out an important niche. Research by IPSOS found that Chinese consumers are increasingly global in their outlook towards food, and they are very open to trying new foods. They are also demanding quality and creativity from their chosen brands, and the rewards are great for those who supply this. A good example of this is the Langham Shanghai ,which boasts T’ang Court, mainland China’s only restaurant with three Michelin stars. As the F&B market grows alongside the broader hotel industry, operators have a huge opportunity in front of them to increase their margins by reducing food waste. 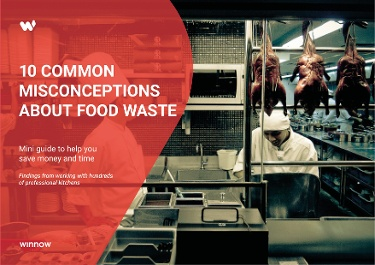 An estimated 200 billion yuan (US$32 billion) of food is wasted every year in China, with a large proportion of this coming from the hospitality sector. Researchers from China Agricultural University found that edible food thrown away from restaurants is equivalent to nearly 10% of the country’s annual crop production. One study by the Institute of Geographic Sciences and Natural Resources Research found that food waste from restaurants could feed up to 50 million people each year. The team surveyed almost 7,000 tables at 366 restaurants in Beijing, Shanghai and the southwestern cities of Lhasa and Chengdu for two years to gather this data and benchmark the levels of waste. In early 2013, a campaign to eliminate food waste swept across China. The movement was called Operation Empty Plate. It became popular after receiving support from the national government, and quickly brought attention to the huge amount of food that was being left on consumer’s plates. At the time, hundreds of Chinese establishments joined the movement by offering smaller plates and abolishing minimum fees. In a nation where ordering a lot of food is a symbol of status, this was a massive step towards a more sustainable system. Four years on, however, specialists believe that things have reverted to how they were before. More recently, though, the Chinese government has been pushing a progressive environmental agenda. It has called on government departments and the hospitality sector at large to implement ‘scientific and civilized food consumption patterns’ in order to reduce waste. Winnow has been working with the hotel and catering sector in China since 2015 and has an office in Shanghai. Working with large brands like Compass Group, Marriot and Shangri-La, we have found that kitchens typically waste between 5% and 15% of all food purchased. In these environments, around two thirds of avoidable food waste occurs before it gets to the customer’s plate. Put simply, we are producing too much food relative to the demand on any given day. This presents a huge opportunity for operators to cut food costs by optimising production levels and reducing waste. Kitchens working with Winnow can typically cut total food purchasing costs by between 3% and 8%. In addition to the financial savings, reducing food waste is also the right thing to do in terms of sustainability. As a result, Shangri-La is working with Winnow to prevent food waste, and the hotel chain has already incorporated composting and herb gardens into their hotels to reduce waste going to landfill. We would encourage all Chinese operators to see food waste as an opportunity to significantly cut costs while also contributing to China’s sustainability journey. In a competitive marketplace and with increasingly demanding consumers, there has never been a more important time for kitchens to run with maximum efficiency.